When the long nights and winter snows have settled across North America and big-game seasons close one after another, predator hunting comes into its own. Fur is thick and glossy. The coyote "rut" begins to kick in, making big dominant males easier to call. Deer are often snowbound and vulnerable, and weeding down a few coyote packs can help minimize predation overkill. About this time, coyote calling and hunting contests across the nation also kick in, generating a lot of excitement and some resentment. Passionate predator hunters test their skills and attempt to augment their incomes, often traveling across state lines to compete. Locals either welcome contestants as beneficial to the local wildlife and livestock or resent them as "professionals" that ruin regional hunting. Which is the truth? And what are the tangible effects on coyote populations? Though I own enough predator calls to outfit every kid in the congregation with one during the local church dinner party, I don't consider myself an expert on the subject. In order to more accurately analyze the above topics, I enlisted the help of three individuals more fluent in the coyote language than I'll ever be. Jason Wagner is a biologist and passionate predator hunter in Texas, and Cory Lundberg and Scott Grange are coyote-hunting nutcases from my home state of Utah that hunt across the Western states and anywhere else they happen to be. I hit each of them with questions formulated to explore the subject. Interestingly, each of them agrees wholeheartedly with the practice of coyote hunting competitions — though not all enter such competitions on a regular basis. As Grange put it, "Let's face it, the only truly effective way to knock coyote numbers down is with poison, and this method was outlawed years ago. Whether it's a competition or a $50 bounty, as is the case in Utah, bring it on. We need more!" Furthermore, as Wagner pointed out, many contests benefit college scholarships, 4-H clubs, and other organizations. Despite the benefits, there is pushback — primarily political. Some from locals who think that such contests ruin their hunting spots, but more from animal rights groups, such as Project Coyote, an organization whose logo touts "fostering coexistence." Such groups coordinate protests, anti-contest petition signature collection efforts, and so on. For instance, Project Coyote led a statewide campaign against northeastern California's annual "Coyote Drive" contest in February of last year, prompting almost two-dozen conservation groups to write protest letters to state and federal wildlife management agencies in an attempt to stop the contest. The protest was unsuccessful. Massive local and national support of the contest arose in response to the anti-hunting propaganda. That, coupled with the fact that the event was in accordance with all California Fish and Wildlife regulations, led to a triumph for supporters of the annual event. The popularity of coyote hunting contests and predator hunting in general is burgeoning. Aptly put by Grange, "&apos;¦predator hunting has become a very popular way to extend hunting season and in some cases provide a little cash in the wallet for those who love being in the field rather than in front of the television." Some areas in states like Texas may host multiple contests every weekend once the big-game seasons draw to a close. There's also been a big increase in industry involvement. 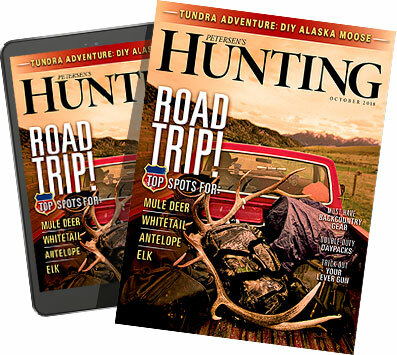 "As predator and varmint hunting is the fastest growing portion of the hunting industry, naturally companies are introducing purpose-built products," Lundberg said. In particular, electronic calling equipment is advancing in leaps and bounds, enabling neophyte callers to successfully lure in coyotes. As Wagner put it, "Just about anyone can go out and call in a predator." But he also pointed out that the screw-ups common with inexperienced callers can educate predators and make them harder to call. "That's why I have some sounds that I don't use much," he said. "But when I do, a coyote will usually come in." How about the effect of contests on coyote populations? Science and practical experience both indicate that it's minimal. According to Lundberg, who studied at Utah State University, the institution's Coyote Research Facility has proven it. He adds, "My team and I once shot 24 coyotes over a 2½-day period in October, 18 over a 2½-day period in November; and 31 over a a 2 ½-day period in December — setting up and calling in exactly the same spots every time. This wasn't during contests — my point is that if an area will support a lot of coyotes it will always hold a lot of coyotes." For the most part, passionate predator hunters are in favor of coyote contests. Long-term effects on predator populations are minimal (though in my own admittedly biased opinion, putting even a temporary dent in a local population can benefit a struggling deer demographic). Manufacturers are offering premium, dedicated predator-hunting equipment and more advanced electronic calls every year, helping beginners succeed. Are there downsides? Not really. So detach your posterior from the sofa, tune up the varmint rifle, and get out into the snow and cold for a little winter wonderland hunting. If you've got the cajones, enter a contest and test your skills. But keep it fun, keep it honest, and don't take yourself more seriously than the well being of the sport.